Barney is in the triangular room shown here. He walks from a point on BC parallel to AC. When he reaches AB, he turns and walks parallel to BC. When he reaches AC, he turns and walks parallel to AB. Prove that Barney will eventually return to his starting point. Let’s begin by examining what happens when Barney begins at a vertex of ABC. Let S be the point where Barney begins his journey and let S=B. In this case Barney can either move along a path which is parallel to AB or which is parallel to AC. If he moves along a line parallel to AC, he will stray from the confines of the room. Therefore Barney must move along a line parallel to AB. Since his starting point is B, Barney’s path will be AB and he will stop when he reaches vertex A. 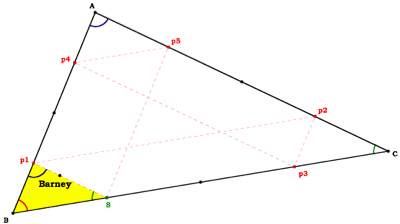 Similarly, Barney’s path will turn, continue along AC and stop at vertex C. Then his path will turn again, continue along BC and stop a vertex B. Remember that our vertex B equals Barney’s starting point S, therefore Barney has returned to his starting point. 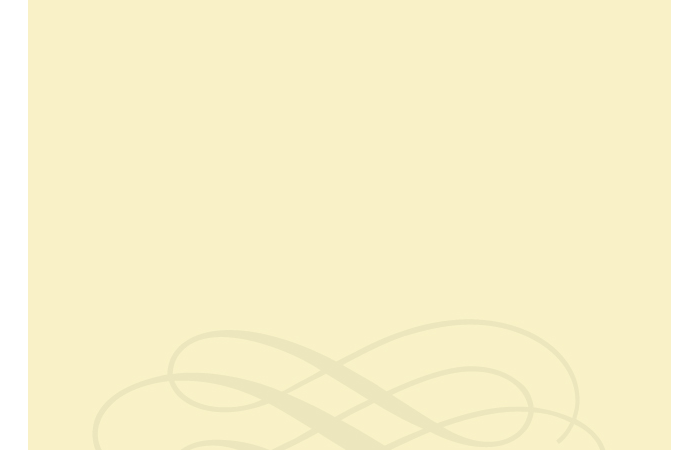 He has made two turns along his journey; in other words he reached a wall two times. Also notice that when Barney’s starting point is a vertex of ABC, then the length of his path will equal the perimeter of ABC. Barney’s Path = length of AB + BC + AC. Now let’s examine what happens when Barney begins at the midpoint of BC. 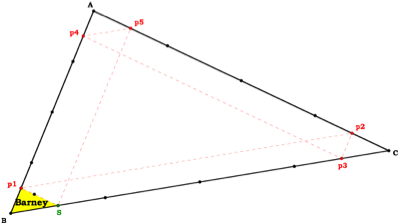 A transversal is a line which crosses two parallel lines. 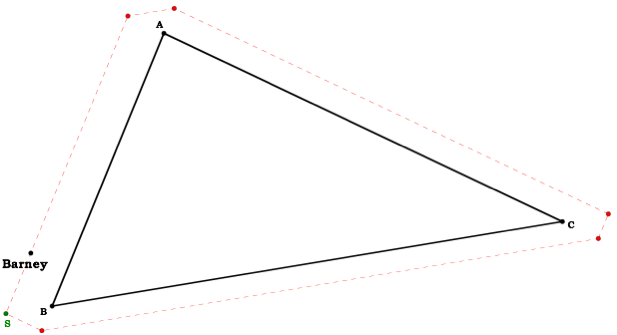 Barney’s path creates a smaller triangle within ABC. 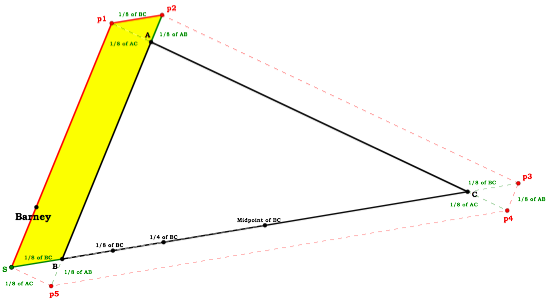 It would be helpful if we could prove this triangle and ABC are similar. Since we know that the first portion of Barney’s path is parallel to AC, we can let AB be a transversal. When AB is a transversal, we can see that angles p1 and A are congruent. We can also let BC be a transversal because it also crosses the two parallel lines. When BC is a transversal, we can see that angles S and C are congruent. 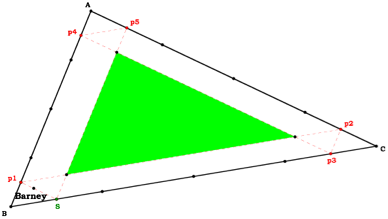 Since angle B is contained in both triangles, we can say that ABC is similar to p1BS because all of their angles are congruent. This means that the point at which Barney’s path reaches AB will be the midpoint of AB. Therefore p1 is the midpoint of AB. Similarly, p2 is the midpoint of AC. This means that when Barney returns to BC, his endpoint will be the midpoint of BC. Since Barney started at the midpoint of BC, he has returned to his starting point. He has made two turns along his journey; in other words he reached a wall two times. 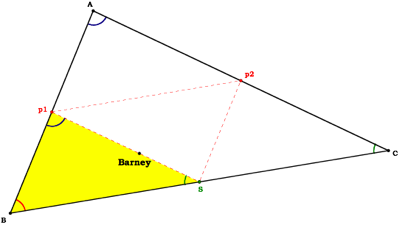 Also notice that when Barney’s starting point is a midpoint of ABC, then the length of his path will equal half of the perimeter of ABC. 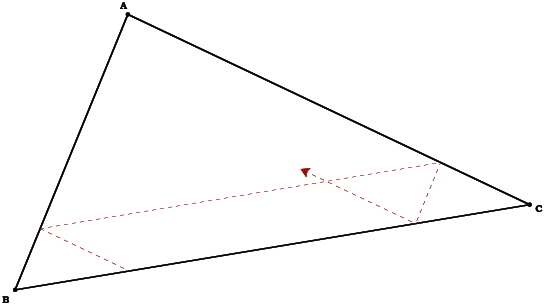 Barney’s Path = half the length of (AB + BC + AC). Now let’s investigate Barney’s path if he begins outside of ABC. Recall the image of Barney’s path when he began at an eighth-point. Notice that it appears similar to the image of Barney’s path when he begins outside ABC. 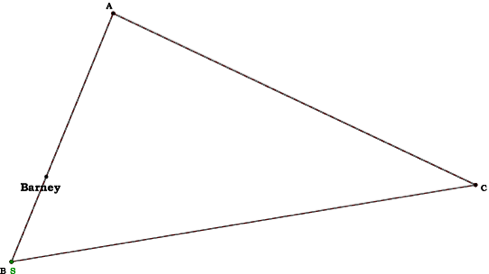 We can prove that the interior triangle created by Barney’s path is equal to 5/8 of the perimeter of ABC. What does that mean if Barney’s path begins 1/8 of the length of BC outside of ABC? 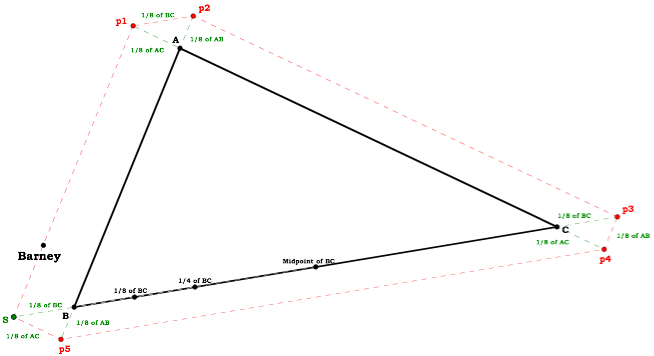 This is the image of Barney’s path if he begins outside ABC at a point which is 1/8 of the length of BC. 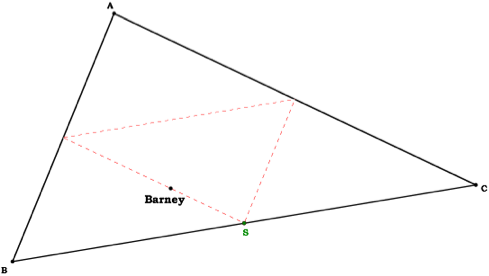 Notice that when Barney travels outside ABC his path forms a series of parallelograms rather than triangles. After all portions are added together, we can see Barney’s journey is 10/8 of the perimeter of ABC. Barney’s Path = 10/8 of (AB + BC + AC). This is the case when Barney begins outside of ABC and his starting point is 1/8 of BC from a vertex.